4100-iSIC Quick Start Guide - NexSens Technology Inc. The NexSens 4100-iSIC (Intelligent Sensor Interface and Control) uses an integrated spread spectrum radio modem for license-free remote data collection from up to a five mile line of sight from the radio base station. 2. Connect the A38 grounding kit wire to the copper lug on the bottom of the 4100-iSIC data logger and the other end to an appropriate earth ground. 3. Mount the desired radio antenna in a location that will maximize signal strength. Attach an RF cable from the antenna to the RF port on the 4100-iSIC. 6. 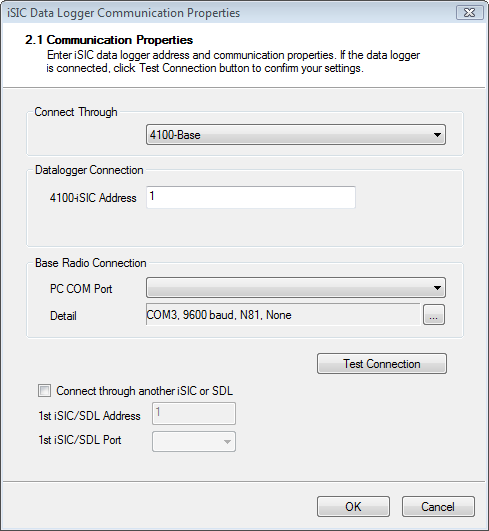 Connect a 4100-Base, 4200-iSIC, or a 3200-iSIC to the monitoring PC and power the device. A base station must be used to connect to the 4100-iSIC. 2. Ensure power is supplied to the data logger and the base radio device. 3. Add the 4100-iSIC to an iChart project file. To accomplish this: Follow the Setup Device Wizard to add a site name, and then select 4100-iSIC from the list of NexSens data loggers. Enter the correct Communication Properties and click Test Connection to check communication.